I’ve been meaning to post this for a while but kept getting distracted. I decided to pattern test* the Wonderland skirt from Lily Sage & Co because I think it’s a pretty cool silhouette but probably was more curious as the whether the style would suit me because I am a typical pear shape. I decided to make my tester version up in Luna printed cotton sateen 6 in green (96% cotton/4% spandex) for the yoke (due to the stretch nature giving me some wiggle room for my body shape) and for the skirt portion I used some black stretch drill (97% cotton, 3% spandex) as I thought it would gather nicely and drape well. The PDF went together flawlessly and everything lined up perfectly. I cut my corresponding size for waist and hip measurements but could have easily gone down a size probably because of my fabric choice and the stretch component. Given this was a test garment I made it up exactly as instructed and without any pattern changes. I did however end up taking 1cm in from each side seam at the end of construction because it got lose after some wearing time, I’d say mostly due to fabric choice. The way Debbie describes construction and the addition of little tips makes for a clean finish and inside and out. The instructions have you make a longer waistband on one side for a hook and bar attachment and an invisible zip (I am pretty impressed with my insertion, pretty invisible!!) for the closure. Due to my own doing, the black drill is a magnet to fluff/dust and is a bit tedious to keep clean. I don’t think I have any of this fabric left now as I had used it for my Built by Wendy Pants that have become a workhorse. Other than the fit, I also turned up the hem more than specified on the pattern, 2 inches in total as opposed to the instructed 1/2 inch. You can see how big the gathered skirt it on this pattern. I personally like to make another version of the completed pattern before writing my thoughts to take into account any pattern or instruction changes. This second version is the final pattern version and I decided to make up view B this time. I used premium cotton sateen (96%cotton/4% spandex) in royal blue. 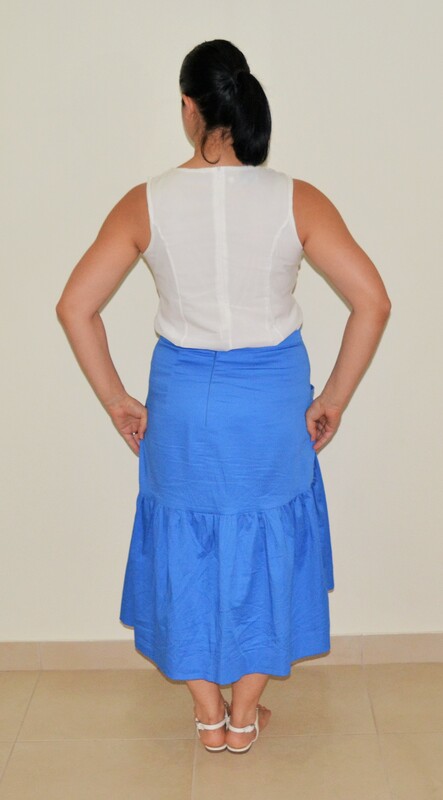 I didn’t want to add a contrast colour to highlight the pockets and yoke details because that would then limit the wearability of this skirt and at the planning stage decided to make thin piping with self fabric at the seams for interest. However after cutting out the skirt I only literally had scraps of fabric left, definitely not enough for my piping idea. 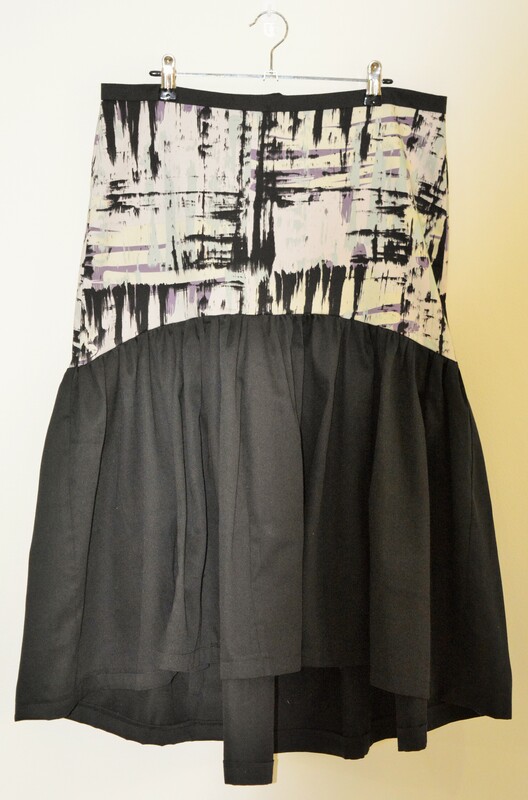 I chose this fabric as it is one I purchased for my SWAP 2015 to make a circle skirt but didn’t have enough to make the skirt length I wanted so decided to use it instead for this pattern and substitute it in place of my planned skirt. Sewing second time around was much quicker. I cut a size smaller than my original tester version and am happy with the fit and didn’t make any fit alterations. I did however change the width of the back skirt piece to be the same width as the front because I ran out of fabric, which was not enough of a difference to make a real significant change to the design. 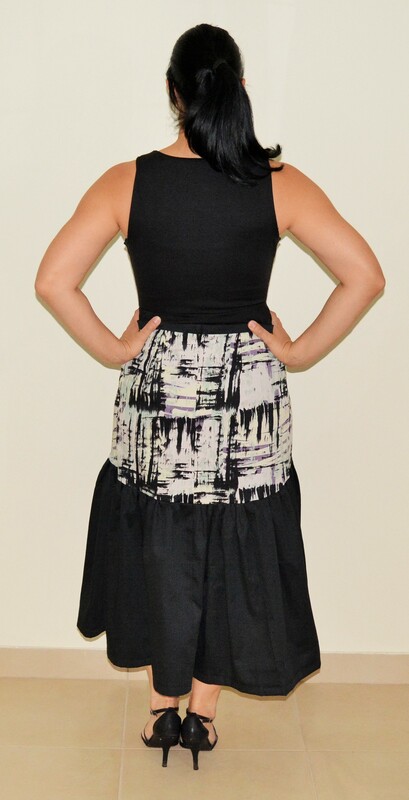 The pockets are really functional, big enough for a phone or keys, and don’t add any additional bulk to the skirt and don’t make it any more complicated to sew up. 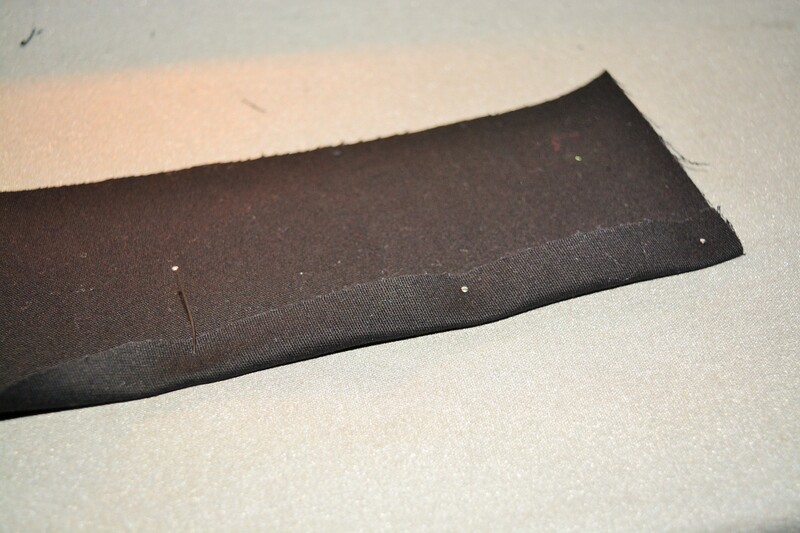 I slip stitched the waistband in place because stitching in the ditch always turns out messy for me. I hemmed the skirt 4 inches this time around as I wanted it at a length that would allow me to wear flat shoes. I turned up 2 inches initially, and then another 2 inches and hand stitched the hem to allow me to unpick and let it down in future if I want a change. 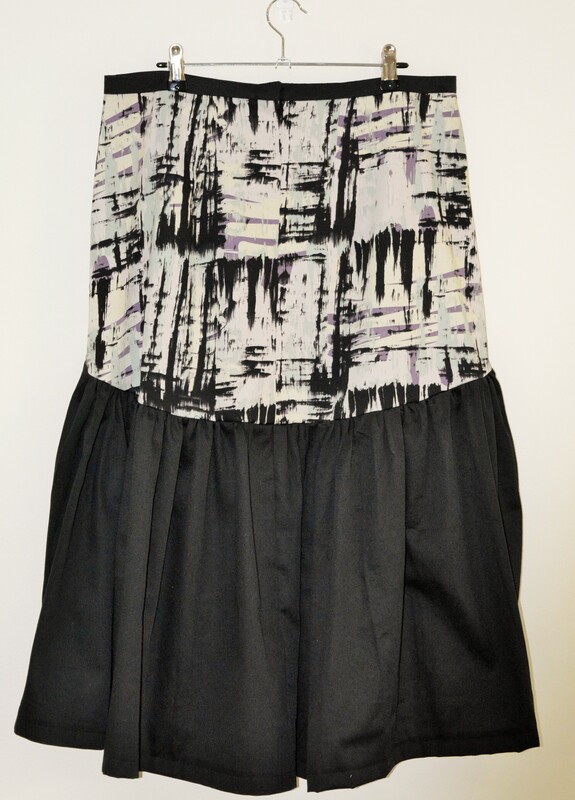 This skirt has transitioned well into my daily wardrobe and it is getting lots of wear as is visible by the crease lines in the photos. Debbie has written more in depth instructions for the final pattern in relation the zip insertion and sewing on the waistband which are really comprehensive with great illustrations to match. The pattern is well drafted for both views and surprisingly quick to sew up. I really like how the patterns from Lily Sage & Co include multiple views, you definitely get you money’s worth, check out some other tester versions on her blog. I was surprised how much I really liked this pattern and the finished skirts. I think two is enough for me for now of this particular style but I think changing up the fabric and skirt portion can make this a really versatile pattern. Recently Debbie changed up her Wonderland skirt to a flounce instead, pushing forward some future projects, such as this one, whereby the yoke is made from lace fabric. I was thinking of using this silhouette/idea in place of my black lace pencil skirt in the SWAP. Debbie is definitely on trend with this pattern as Toni Maticevski‘s collection had some similar silhouettes recently, so you could really make your own “designer” skirt for a fraction of the price. She is doing a great job of creating unique and wearable fashion and I’m amazed at the speed and quality in which she is getting these patterns out. Do you sew “cake” or “frosting”? as Tasia from Sewaholic wrote about. I think I have always been a frosting kind of sewer as cake was so easy and cheap to buy however I now look at my wardrobe and see that my everyday basics are lacking as I mentioned in my previous post. This is the first year I have made a sewing/wardrobe plan discussed in this post and really need the basics to make my wardrobe more functional. One of my main problems is that I don’t own any jeans or pants, currently. Not because I don’t like to wear them but I find it so tedious to shop for them as I am pear shaped and things fit at the hips but gape at the waist and often are too long in the leg. After so many years I am finally beginning to understand my body shape and I think sewing has really helped with that albeit I’m far from fit perfection. As I also get older, the fit of a garment becomes more important as it also dictates comfort however it makes me my own worse enemy as I am fussier when shopping. These Simplicity 3850 Built By Wendy Pants “slim pants, capris and shorts” are now OOP and are the first pants I have made in a long time. 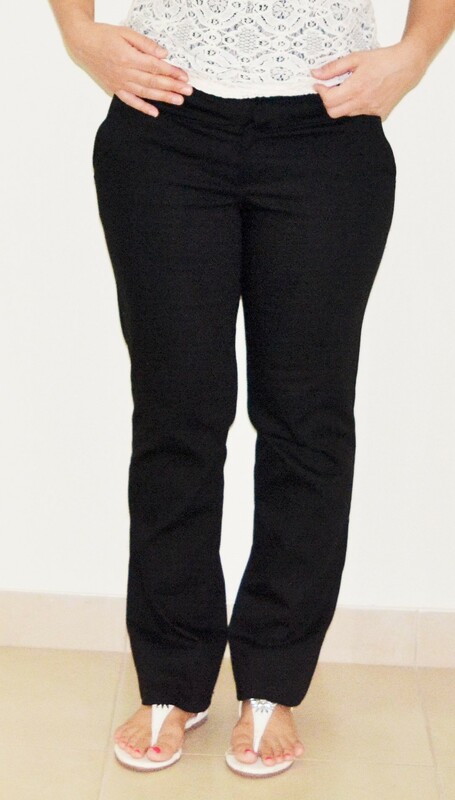 In theory pear shaped women should favour a pant with more flare at the bottom but I prefer a slim fit. I used some stretch drill, 125cm wide (97% cotton, 3% spandex). I followed directions to the letter, I’m not confident enough to do things my own way, just as well, because oh my fly! That part had me stumped and staring at the instructions over and over. I thought it was weird that you are to buy a 7 inch zipper and then cut to fit upon insertion. I lopped off a good 3 inches I think. I also wished I had serged the fly and crotch seams prior to assembly because I forgot and these are the only parts of the pants not completed neatly. The pocket installation also confused me, not so much the process but the names of the pattern pieces. 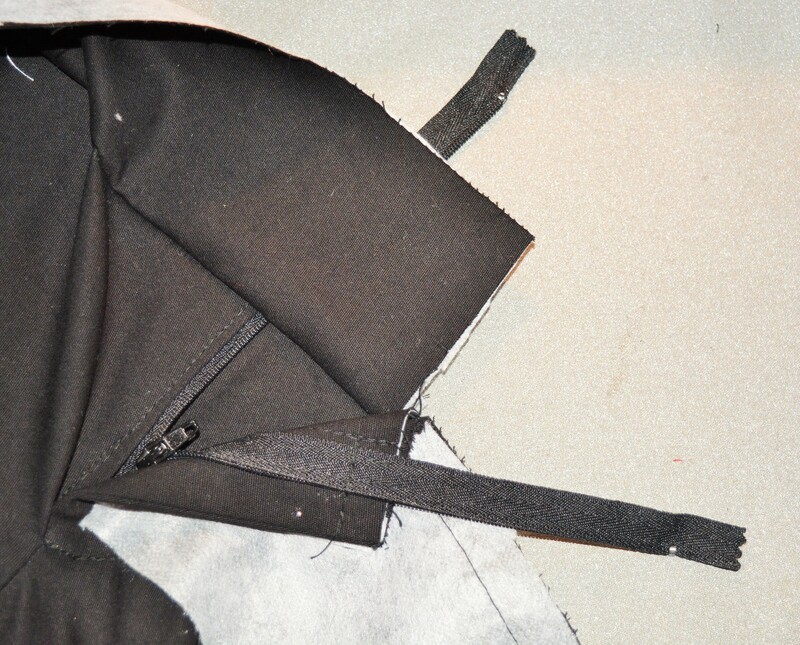 The pocket lining is cut from pieces labeled “pocket facing” and “front yoke and pocket” and only from the cutting layout is it evident they are to be cut as a lining. Well first time I cut them from my fabric, then second time cut them from the lining, and then while sewing I used the fabric pieces instead. Does that make sense? Lesson learnt, throw away the fabric you no longer require because it makes sewing a whole lot less confusing. They turned out ok but it just means they are thick pockets. I also didn’t added the called for buttons on the back pocket flaps because I wasn’t sure how comfortable they would be to sit on but I might go back and do that since I will be wearing these regularly. The waistband is a little tight, I used ribbon instead of twill tape at the seam because that is all I had and of course this means there is no stretching in this area. 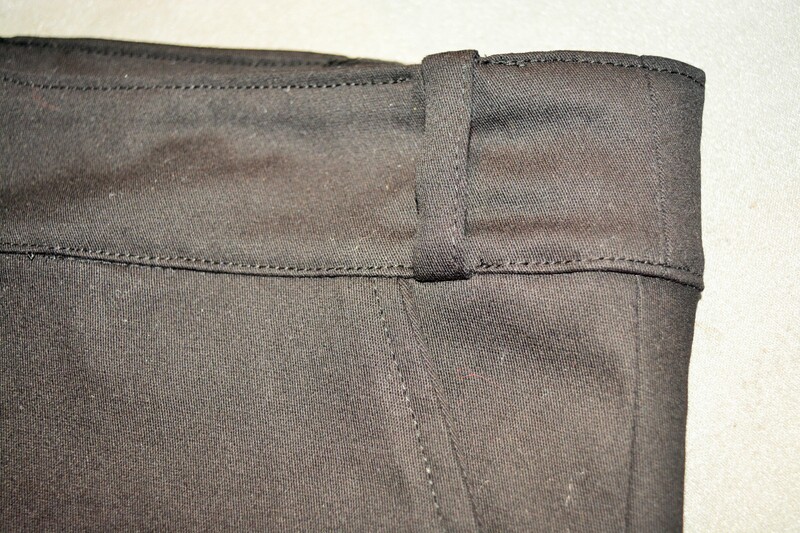 I didn’t want to risk buttons popping so I sewed a trouser hook instead for the closure. I also didn’t line up the edges of my belt loops to the edge of the waistband during construction and cut off the overhangs which means the loops are a little tight and pull on the waistband but with a belt it won’t show very much and I don’t wear tops tucked in anyway. I have discovered over time a way to iron the folded edges in small pattern pieces by folding over and pinning it down on my ironing board which has a honeycomb metal base and lots of padding so the pins stay in place quite nicely while I iron the edges flat. I also hemmed them quite a bit, about 3 1/2 inches but feel upon wearing I might take them down a bit again. I didn’t cut any length off and had handstitched the hem in place. After wearing them for a day, this fabric attracts lint like no bodies business. Anyway, all that aside, the pants fit okay but a little tight around the thighs and which I think will stretch out with time due to the fabric. I will probably do a 3/8 instead of 5/8 seam allowance next time as I cut out the biggest size I had. Definitely some tweaks to be made, there is pulling at the front and at the back thighs (see those smile lines), but overall wearable and functional. I will make another pair sometime with different fabric and try and fix the fit issues. At the end of all this I need to sew a lot more “cake” but I won’t stop sewing “frosting”.